In the course of the First World War, five major battles were fought around the Belgian town of Ypres. 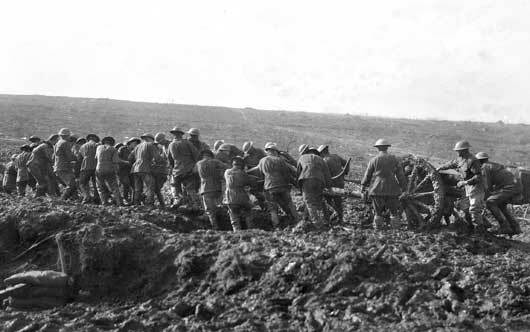 All five Australian divisions took part in the Third Battle of Ypres, which was in fact a series of battles culminating in the Battles of Passchendaele. 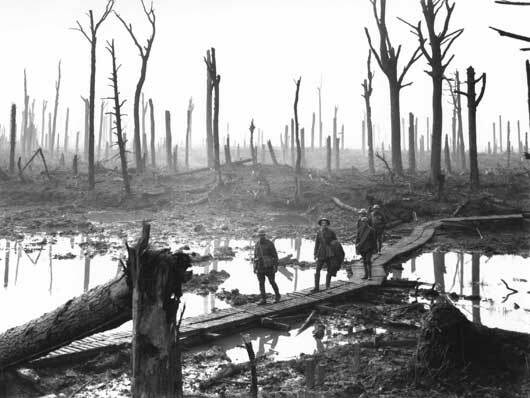 The Third Battle of Ypres opened on 31 July 1917, but bad weather in August partially flooded the battlefield and a further British attack on 16 August gained little ground. The next attack did not take place until the ground had dried out. A new strategy known as ‘step by step’ or ‘bite and hold’ was adopted, which called for an advance that would not extend beyond supporting artillery that could assist in defeating the expected enemy counterattacks. The Australians were brought into the battle as part of General Plumer’s 2nd Army, and were given the task, on 20 September, of advancing along the Menin Road towards Gheulevelt. With good planning and efficient artillery the Battle of the Menin Road was a great success. Further successful advances followed at the Battle of Polygon Wood on 26 September and at the Battle of Broodseinde, on 4 October although casualties were heavy. 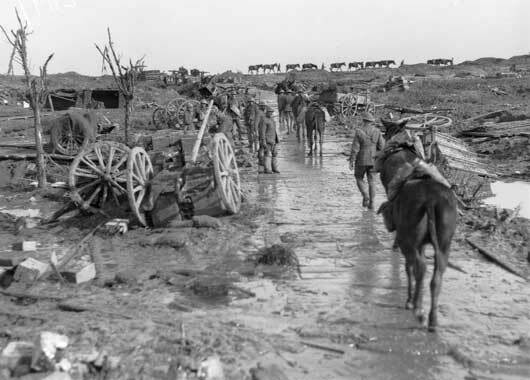 The weather again broke and the constant rain turned the battlefield into a quagmire so that further attacks on 9 October at Poelcappelle and on 12 October at Passchendaele failed with heavy loss. The Canadian Corps was now given the task, and in five attacks between 26 October and 10 November, succeeded in capturing Passchendaele. 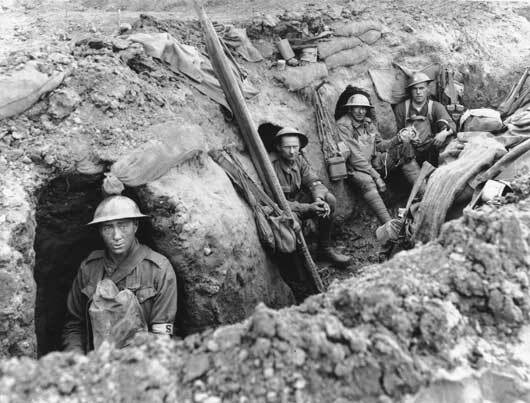 Over 38,000 Australians were killed or wounded in the Ypres battles. The stone lions that marked the Menin Gate in the Ypres ramparts during the war now flank the entrance hall at the Australian War Memorial in Canberra. 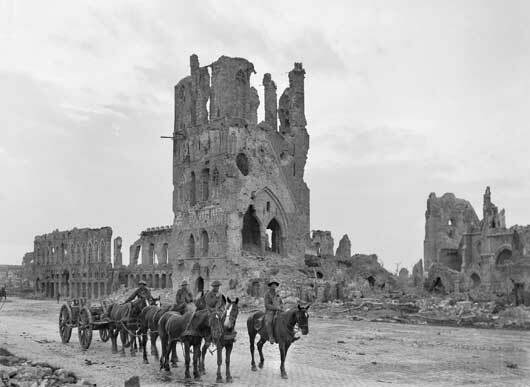 A loaded limber passing the ruins of the Cloth Hall at Ypres (AWM E00717). 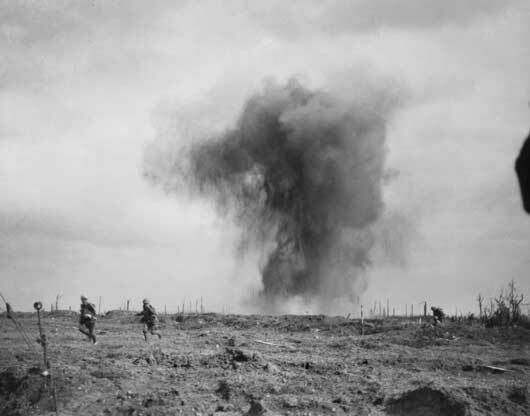 Soldiers running to take shelter from a heavy shellburst at Glencorse Wood in the Ypres salient (AWM E00737). Australian members of a field artillery brigade passing along a duckboard track in the devastated Chateau Wood (AWM E01220). 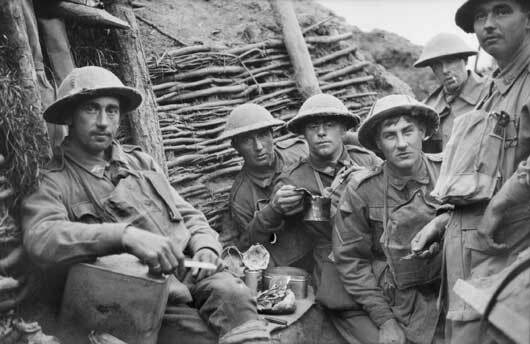 Members of the 22nd Battalion, AIF, taking a meal in the trenches on the night before the opening Australian attack in the Third Battle of Ypres (AWM E00739). 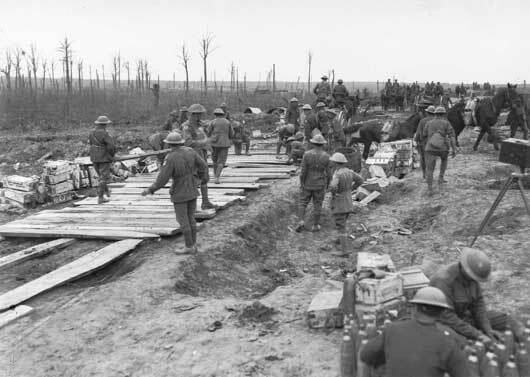 Members of the 2nd Australian Pioneer Battalion making a wagon track from planks of wood at Chateau Wood (AWM E00800). 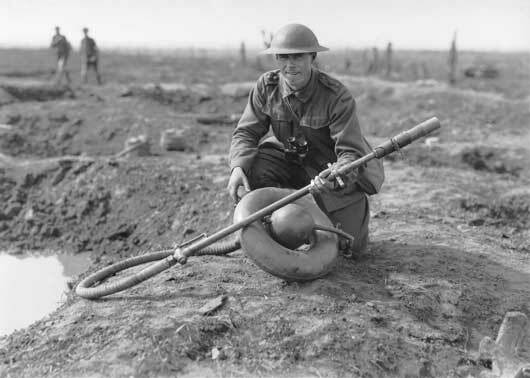 Lieutenant Leslie Bowman Cadell, 6th Battalion, holding a German flame thrower captured near Stirling Castle (AWM E00802). Medical details of the 45th Battalion sheltering in a trench at Anzac Ridge, in the Ypres Sector (AWM E00839). A gun of the 1st Australian Field Artillery Brigade being pushed over the boggy ground at Anzac Ridge (AWM E01056). A view of the road running up to Idiot Corner, on the Westhoek Ridge (AWM E01197).